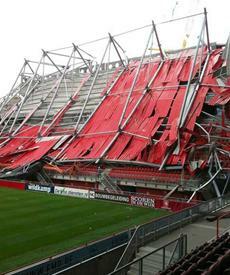 A section of FC Twente’s stadium ( De Grolsch Veste) roof collapsed early today morning ( Thursday), trapping 12 people inside. One person has already been declared dead in the stadium collapse while 10 others have been hospitalised, the town’s mayor Peter den Oudsten has said. The stadium was under renovation at the time of the roof collapse. Twente wanted to increase the stadium capacity to 32, 500 from its current 24,000 capacity. 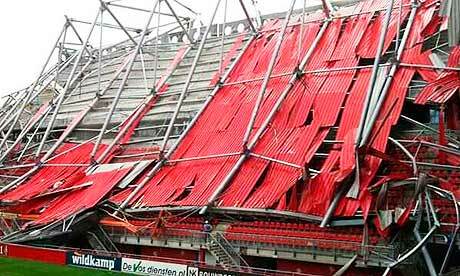 Two support beams at the De Grolsch Veste Stadion apparently collapsed for reasons unknown presently. 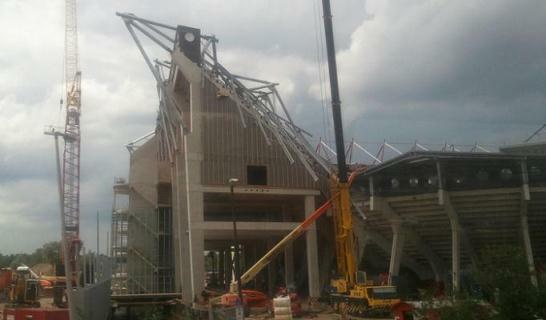 Workers were adding a second tier to an already existing stand in the area that collapsed. Twente are one of the most prominent sides in Dutch football, having won the league two seasons back and finished second last season. They are based in the city of Enschede and were also involved in the Champions League last season against the likes of Inter, Tottenham and Werder Bremen.